The fourth of July was a busy time for us! Our church had a float in the parade, which actually won 4th place in the float competition!! After the parade, we went to the U.P. to spend some time with Tim’s family. We were able to spend time with all 3 of his sisters, and with 2 of his aunts. It was great to be able to spend time with them. We went to the fireworks that evening, but first did a few little fireworks of our own. The place to watch fireworks is within walking distance from Mom and Dad Hill’s house. We got there, got all set up and it started to rain. There were clear skies ahead, so we knew the rain wouldn’t last long, and would probably get back to the house by the time it stopped. We waited out the rain, and the fireworks began a little early. It was a great fireworks show, and made for an even more memorable experience since we were all wet by the time we got back to the house. One highlight was being able to go out to lunch with just the ladies. Tim and Dad Hill were so kind to watch the boys to allow us a little time away. Another highlight was on our last night there, when we went out to Presque Isle for picnic dinner. Micah and Wesley loved being able to throw rocks into the lake. And it was so fun to watch them find enjoyment in feeding (and chasing!) the seagulls. After dinner, we took a walk around the island and allowed the boys to play at the playground for a little bit. It’s so fun watching Wesley enjoy the slides and wants to copy Micah. We couldn’t go back home without a little bit of Jilbert’s ice cream first! I'm so thankful that we live closer to family to be able to have these times together! Mom and Dad Ahtila were able to come for a week visit back in June. They ended up camping about 45 minutes from us, so we were able to visit with them almost every day.On Sunday they came out to join us at church, and then we had a nice meal to celebrate Fathers’ Day.We went out to visit their campsite on Monday, and had a mini-family reunion. I was able to see my Grandpa and Sonja, who I hadn’t seen in a while, my aunt and cousin who I hadn’t seen in a couple years! We spent a great deal of time at the playground, which was really nice! It was so much fun to watch Micah grow in his confidence as he learned to climb up the slide and the rope ladders. My parents had a beautiful view of Lake Michigan from their campsite, so we couldn’t have a visit there without throwing rocks into the water…one of Micah’s favorite activities! Wednesday I joined my parents on a day trip to visit my Grandpa and Sonja again, and we were able to spend a little bit more time visiting with my aunt and cousin as well. I also saw an uncle I hadn’t seen in years! Micah’s highlight was being able to drive cars on my Grandpa’s chair, and eat McDonald’s on the way back. Our fourth anniversary was on the last day my parents were in the area, and they excitedly volunteered to watch the kids for us. There will be more to come about what we did for our date. While we were out, Micah learned how to catch a ball and was quite proud of himself! He wanted my mom to take a picture of him every time he caught it! We were so thankful for the time we were able to visit with them. We all had a great week!! This year I turned 29...my last year before the BIG 3-0!! Tim's parents were able to come down to help celebrate. They also watched the boys for us so we could go on a date. We started our time by going out for coffee at a cute little shop here in town. We were so blessed (and surprised!!) when we ran into someone we knew there and they paid for our coffee! We then headed up to Dave's Falls for a little hike, and ended up eating dinner at a local restaurant. When we came home from our date, we celebrated with cake. I have really been wanting to improve on my cake baking/decorating skills. This was a cake that Tim and I actually made together--and it was so fun and yummy! It was a Red Velvet Cheesecake Cake. And I would make it again in a heartbeat!! Then our little Wesley turned 1 year old on May 25th! It's so hard to believe that a year has passed since he was born! He has such a funny personality! He's almost always smiling, such a cuddler and people person, and so very stubborn! He has brought even more laughter into our home, and we're so thankful to God for giving him to us! We celebrated Wesley's birthday on 3 different occasions! We tried celebrating when we went to MI to visit my parents, where we found out Wesley wanted NOTHING to do with his cupcake! So...when we celebrated his birthday on the actual day, I made chocolate chip cookies instead. They were a hit! And his final celebration was with the Hills, where we celebrated my mother-in-law's birthday, sister-in-law's birthday and Wesley's birthday. We're so thankful to be closer to family, so we can share these special times with family. Wow! It’s been a while since we’ve last posted anything on here! These next few posts will be to help catch up on the last few months…starting with Easter! This year Micah was able to help out much more with dyeing the Easter eggs. He absolutely loved being able to pick what color he wanted and help dip the egg, and later put stickers on them. 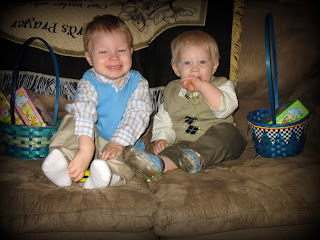 Here are a few pictures of our handsome boys decked out in their Easter outfits. 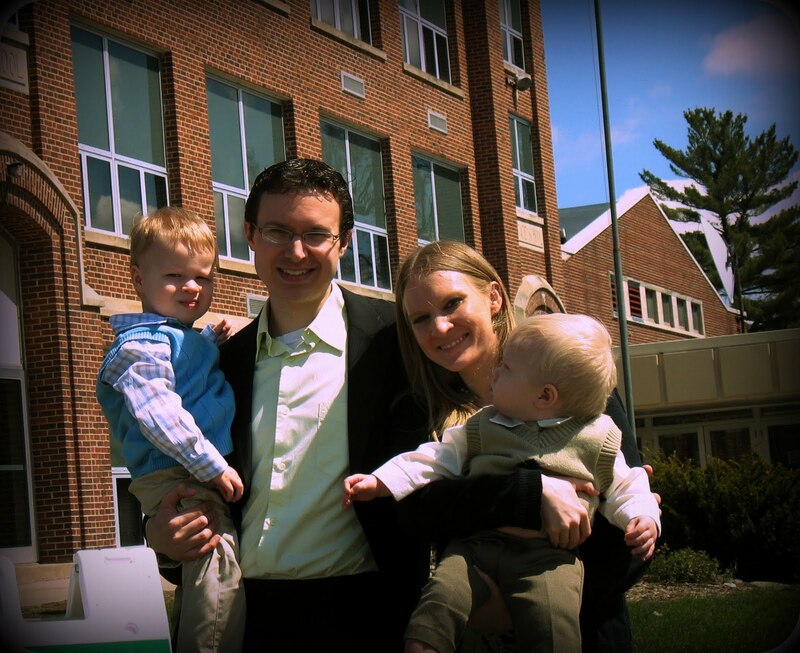 I was looking through some old pictures, and realized how different Micah and Welsey look! When dressing Wesley, I purposely chose outfits to get pictures, because I knew we had previously taken pictures of Micah in those outfits. The other day was the first time I compared the pictures of the two boys. I think there are certain characteristics where they look similar, but overall they really look different! Micah definitely resembles more of the Hill side and Wesley resembles more of the Ahtila side. It will be interesting to see if they start looking more alike as they get older. In the pictures that follow, Micah is in the first picture in each pair. Because Micah was such a chunker, he needed larger clothes sooner, so he's younger than Wesley in most of these pictures. The first picture is the only one where I think that they look similar. I tried putting them side by side, but I just can't seem to get it right...so this is as good as it gets! :) Hope you enjoy it as much as I did!